Sieg (ジーク, Jīku?) is the main protagonist of Fate/Apocrypha series, who acts as the second Master of Rider of Black during the Great Holy Grail War. He appears in Fate/Grand Order's Apocrypha/Inheritance of Glory event as a Caster-class Servant able to be summoned by Ritsuka Fujimaru. Sieg was created by Yggdmillennia as one of their many homunculi suited to various purposes. Initially kept in a magical energy supply tank devised by Gordes Musik Yggdmillennia to grant energy for Servants and was originally known as Homunculus (ホムンクルス, Homunkurusu? ), he was one of many allowed to be used by Caster of Black for usage as harvesting materials for his golems. Due to his unexpectedly high quality Magic Circuits, he was thought to be a good choice for Caster's Golem Keter Malkuth. A standard characteristic of Einzbern Homunculi, Sieg's eyes are the same deep, dark red of polished, perfect rubies. His hair is brown, though it appears to darken ever so slightly as he 'ages'. At the outset, Sieg's physique is quite slender and frail, like a newborn infant, and equally as weak. His standard clothing consists of a black waistcoat, white shirt, black slacks, and a pair of black leather penny loafers. After obtaining the heart of Saber of Black, his physical appearance changes slightly to mimic that of Saber. While his hair only darkens (and shortens) slightly, he grows far taller than he originally was, and the frailty of the past was replaced with a slender-but-hardy build much more suitable for fighting in a Holy Grail War. He also swaps out the loafers for a pair of half-boots. A-1 Pictures character sheet of Sieg in Fate/Apocrypha, illustrated by Yū‏‎kei Yamada. A-1 Pictures Wallpaper Illustration of Sieg in Fate/Apocrypha, illustrated by Yū‏‎kei Yamada. A-1 Pictures promotional art for Fate/Apocrypha, illustrated by Yū‏‎kei Yamada. Caster Stage 1-3 in Fate/Grand Order, illustrated by Ototsugu Konoe. Sieg comes into consciousness without anything to form a personality. He is scared of everything but himself, believing to be nothing. He calls himself transparent and colorless because he possesses nothing and had received nothing from his birth. After escaping and receiving the hero Siegfried's heart, he becomes notably more selfless and brave as he gradually continues to develop as a person. Of his own volition, he decides to forsake a life of happiness, and instead aims to fulfill the desperate wishes of freedom his brother and sister homunculi who would die if nothing was done to save them. Eventually, he even willingly becomes a participant of the Great Holy Grail War in return for their promised freedom and safety as well as for the sake of both Astolfo (who had previously saved him) and Jeanne (who protected him). Due to his young age, he is initially very much naive and clueless about things such as common sense, basic human behavior, and how the world works though he is able to pass as an eccentric but otherwise normal, if slightly clumsy, human with a calm and logical personality in a very short amount of time. While typically very polite and humble, Sieg can at times display a blunt attitude during the rare instances he feels annoyed or frustrated. He also has a tendency to blurt out slightly rude observations without really meaning to which occasionally gets him into trouble with others. He seems to have a high capacity for forgiveness as shown when goes as far as to unhesitatingly throw himself in harm's way to save both Caules and Fiore when their lives are in peril despite the Yggdimillenia's treatment of his brethren. At the same time, however, Sieg is extremely vengeful when those he cherishes have been harmed before him, not caring whether his enemy is a magus or a Servant, the only thing that matters in his mind is the fact that he will kill them. After their final encounter with Assassin of Black and witnessing her, along with the children of Scotland Yard's horrific pasts, Sieg's innocent belief of humans being slightly flawed but inherently good creatures crumbles, leading him to began to question humanity's true nature. While he takes Jeanne's advice on not giving up on humans to heart, and ponders over the opinions of several other heroes on the matter, Sieg ultimately seeks his own answer to how he views humans and life as a whole. Similar to Siegfried, he places little value on his own life and comes to view himself as something that can be used to save and help those around him, causing him to make reckless choices simply for the sake of what he believes 'he should do' instead of what he wants to do. He claims to have no interest in the normal, peaceful life Astolfo spoke of before, but it is revealed during a conversation with Jeanne that deep down, he does have a longing for it but willingly overlooks this fact for what he feels is a more worthwhile purpose that can grant meaning to his life as well as honor to the hero Siegfried who died for Sieg. Thankfully, both Jeanne and Laeticia eventually encourage him to start considering his own value more as he realizes that just worrying about the value of humans and his unfortunate sense of obligation towards others without looking into himself would leave him truly empty in the end no matter what he ends up doing with his life. While Sieg had his own reasons for opposing Shirou Kotomine's wish for salvation, the main reason Sieg chose to trap himself on the Reverse Side to prevent mankind's extinction that would have resulted from the priest's wish at the end naturally wasn’t solely for humanity’s sake in and of itself. In the first place, Sieg himself admits he hadn't experienced enough to completely believe in humanity though he accepts their nature and simply chose to strive to believe in the good they are capable of. Most of all, it is because he witnessed Jeanne D'Arc's struggles and eventually came to understand her that he acted. For her who had everything taken from her due to betrayal in life, who received the worst treatment conceivably possible for a human, and yet never cursed anyone in the end and even gave up her life to protect their future, Sieg wanted to 'become her strength' and thus carried out her will, acting for the first time on his own personal desire rather just giving himself for someone else's sake because it's what he felt he should do. When encountered during the Inheritance of Glory event, he's developed even more. His personality is relatively the same as it was at the end of the Great Holy Grail War, but he's notably wiser and tempered by his past experiences. He is still somewhat awkward at interacting with others by himself as seen when he first meets the protagonist and attempts to make himself appear as a solemn dragon, an act he fails comically at as he often has to take many pauses to properly explain the current situation, flounders between the rough 'ore' pronoun and the more dignified 'ware' when referring to himself multiple times in the same conversation, accidentally joyfully roars loud enough to briefly deafen the protagonist when they agree to assist him. Sieg holds a deep admiration for Jeanne and also wants to support her by becoming her strength, having found her ideals and the manner in which she lived very sad but at the same time unspeakably beautiful, and tries to follow her example as best he is able. It's thanks to her words and faith in people despite being betrayed by them, that he doesn't fall into despair during the aftermath of the confrontation with Assassin of Black and is willing to learn more about humanity instead of simply giving up on them. It could be said that, in that moment, while she didn't save his life like Astolfo and Siegfried, she managed to save his heart. In the battle with Lancer of Red when he was on the verge of giving up, the thought of wanting to see her again was all that kept him going when he faced certain death. Though he doesn't realize what his feelings even after the fight, he does realize how important Jeanne is to him and rushes to stand by her side and support her. When she gives her life trying to destroy the Greater Grail with her Noble Phantasm only to be foiled by Amakasu Shirou's interference, Sieg snaps and flies into a murderous rage and battles the enemy Ruler so that her sacrifice would not be in vain. Many, many years after the war, Sieg and Jeanne meet once again in the Reverse Side of the World and Jeanne confesses her love to Sieg, saying unto him,"I am in love with you." Upon hearing those words, finally Sieg realizes just why he had been waiting in the other world for her for so many years. Astolfo, more than just his Servant, is Sieg's best friend as well as the savior of his life. He greatly respects Rider and cherishes him deeply, stating he would go as far as to die for Rider if the need ever arose so long as Rider would be saved and could continue to exist in the world without him. While Rider thinks of himself as weak, and curses his weakness for being the reason as to why Sieg threw away his chance at a normal life to save him from Mordred, Sieg wholeheartedly believes in Astolfo's strength. To him, Astolfo is truly an amazing person and a brave hero through and through. Though Rider's wild antics, tendency to let extremely important details slip, and miraculous talent for finding them both in outrageous situations do cause the Sieg to bury his face in his hands and sigh. Sieg's ally and mentor figure. Along with Astolfo, Chiron was one of the first Servant's Sieg would meet after escaping his prana tank. In contrast to Astolfo's overly affectionate coddling towards Sieg, Chiron is very direct and frank about his situation though ultimately well-meaning and kind. He is endeared by the boy's innocence and expresses his desire for Sieg to be able to pick and choose a way to live that would be able to leave him without any regrets. Sieg respects Chiron and trusts him greatly, following his advice regarding life and instructions on the battlefield without question. As Chiron is someone always eager to teach and Sieg is an individual eager to learn, he often has a mountain of questions ready for the sage at any time. The legendary hero who gave his life to save the dying Sieg. Despite not knowing him personally, not having shared a single word with one another, and not being asked for his help, Siegfried willingly gave up his own life to save Sieg of his own personal desire to follow not what is simply ordered of him but the ideals of justice he failed to live up to in his previous life. Satisfied with finally being able stand up for and do what he believed was right, Siegfried vanishes from the world with no regrets while Sieg is left with overwhelming feelings of both guilt and gratitude, seeing it as his duty to somehow live in a manner that pays honor to the hero who did not even hesitate to sacrifice his life to save a mere homunculus. It is because of this that the then nameless homunculus calls himself 'Sieg' in honor of his hero as he desired to carry at least half the man's name so as to never allow himself to forget what Siegfried had done for him. Sieg's rival and eventual comrade with whom he gets along with relative difficulty. Initially Mordred displays visual frustration towards the very existence of the Yggdimmillenia homunculi as they seemed to be nothing but mindless, emotionless tools, a notion she herself resents being a homunculus herself. It wasn't until meeting Sieg who displayed a strong sense of self much like herself in protecting Astolfo she would see otherwise. Initially she planned to simply leave him be but after he miraculously managed to stab her with Astolfo's sword while her guard was down she makes up her mind to see him as an opponent worth cutting down and does just that, only afterwards showing respect towards him for his resolve and promises to remember his name. When Sieg comes back and does battle with her again as Siegfried, she initially mocks him as a counterfeit Servant but all the same does battle with him once more, only truly becoming enraged after seeing he somehow survived the clash of their Noble Phantasms vowing that she, and she alone, would be the one to have the priviledge of killing him. Ironically, she would end up saving him from a deranged Celenike later on, seeming to have come to develope a strange sympathy for a fellow homunculi with a will of his own. They would even team up and work together against Adam later on under Chiron's direction. When they meet again in town, Sieg with Astolfo in tow would treat her to lunch in order to ask for her opinions on humanity. Seeing that Sieg has no grudge towards her for killing him, she decides to forgive him for surviving her Noble Phantasm which makes them even in her eyes and only serves to greatly confuse Sieg. Ruffling his hair and smiling cheerfully, Mordred leaves behind one last promise to meet again on the Hanging Gardens ...and an exorbitantly high bill for all the food she ordered. Though they had not interacted with one another, Sieg having witnessed her being impaled by Mordred was moved to attack the knight and as a result was killed by Mordred. In an attempt to take down Saber of Red Frankenstein would utilize her suicidal Noble Phantasm. Following her demise, her life and will would transfer to Sieg, rescucitating the boy, and granting him use of Galvanism. With it, Sieg would be able to use Balmung without immediately losing Siegfried's form afterwards, be able to survive and quickly heal from being shot in the heart multiple times at point-blank range by Reika whilst still moving with enough speed and precision to catch and destroy her following shots with magecraft, continously use Balmung in rapid succession in the battle against Lancer of Red, and slow down the deadly effects of the Dead Count Command Spells curse temporarily. She would only fully manifest within Sieg after his rage towards Amakusa Shirou's for Jeanne's death awakens her soul and would grant him concious use of her powers and a significantly weakened version of Blasted Tree in the final battle. Initially Sieg had nothing but hatred within his heart for Jack the Ripper after her attack on Yggdimillenia injured and took the life of his siblings, provoking him to pursue her out of vengeance even if it meant getting killed in the process. After he had seen her horrific past, Sieg's burning feelings of hatred dissipated, and in their place was confusion and distrust towards humanity as well as a deep sorrow towards Jack, regretting that he was not able to save her. Sieg, originally just an unnamed homunculus, first begins to gain sentience around the time the Black Faction has summoned all of its Servants. Originally, he is conscious without the ability to form thoughts, only a weak "instinct" protesting about a great pain. Without the ability to form thoughts or have recognition of anything, he cannot assert himself or clearly be called "alive." Simply by existing, he is able to receive "information", leading to "time" to process the information that eventually creates "knowledge" within him. He becomes conscious, and he is able to realize the simple fact that he is a living creature. The cycle of learning begins to repeat at a great speed, bolstered by his Magic Circuits. He recognizes many beings, including humans, homunculi, and Servants. The humans ignore him, the homunculi, his comrades, view him with faint emotions, and the Servants, monsters, display a wide variety of expressions. There is no great change in his situation with the acquisition of knowledge, but he slowly begins to organize it within himself and begins to feel strange with the more information he obtains. Without realizing it to be fear in wanting to turn away from that which is in front of him, he cannot even understand it being an act of cowardice because he has yet to understand the idea of courage. After the scouting of Kairi Sisigou and Saber of Red leads to battle with several of Caster's golems, Caster and Roche Frain Yggdmillennia appear before Sieg, discussing the process of inserting Magic Circuits into the golems. Identifying them by their "codes", names, Sieg is able to recognize that they have appeared before him numerous times, and using his information, he is able to determine the insertion of Magic Circuits equates to the destruction of that which is consumed to supply them. Having not previously understood death, he becomes scared upon drawing the conclusion that destruction equals death. As he is selected along with two others for Caster's usage, the part of him that had been scared clearly notes that he will soon die. Though he initially believes that there is no recourse, he decides to act due to being able to do what the other homunculi cannot, obtain information, think, and fear the conclusion. With the coincidence of obtaining an identity along with the coincidence of being chosen to die, his fate begins to move as he moves his arm for the first time in his life. Affirming his situation as he attempts to move, he makes both his hands move to beat against the reinforced glass. Realizing the futility in trying to break it physically, he scans his Magic Circuits to work a spell that weakens the glass enough for him to escape, breaking it and allowing him into the world from which he had been isolated. Injured from the glass, he removes his breathing apparatus and takes his first breath. He quickly reminds himself that escape from the glass was only his initial goal, quickly seeking to escape. The ability to stand was not imbedded into his functions, so he can only fall and feebly craw along the floor. Slowly managing to stand, he is filled with great pain as he begins his first steps. He does not know his path, only knowing that he will die if he stays, and he can only walk forward with great trepidation of further pain as he ignores the "whispers" of the homunculi behind him. With skin as soft as that of a newborn, simply walking is enough to bloody his feet as he searches for a destination. Thinking himself to be a meaningless existence as his weak body struggles along, he can only believe that he will die without meaning in the same way he was born without meaning. He pauses in confusion as he realizes Rider of Black has come before him, unable to move out of fear. Soothed by Rider's concern, he recognizes Rider and unconsciously mutters for Rider to help him before fainting. Before fading out, he only wishes that he will continue to be alive. Rider decides to help him, bringing him Archer of Black's room to hide him from Caster's pursuit. Archer realizes the situation, letting them in and preparing to look him over due to his expertise on medicine. He states that Sieg overused his circuits and tore through his veins in destroying the glass and further collapsed from exhaustion. He tells Rider of Sieg's physical condition and short lifespan, and Rider affirms that he will keep helping him until the end, as he would not be able to survive on his own. Sieg awakens during their conversation, so he gets up at Rider's prodding. Extremely nervous, he is unable to understand Rider's meaning as he asks about helping to grant Sieg's wish. As he thinks about it, he believes a powerless being with no history has no right to have a wish in the first place, having given up such a right in the first place. Although he believes he does not deserve such a thing or that it will be granted, he asks Rider to save him. He is shocked when Rider agrees immediately, but becomes moved enough by Rider's innocence to have no doubt in his words. Siegried sacrifices himself and removes his own heart to give to Sieg. Sieg receives the Siegfried's heart. Sieg migrating to the Reverse Side of the World. He clashes with Saber of Red during a large battle. She calls him a fake Heroic Spirit, and he acknowledges that he cannot match up to a proper Heroic Spirit. In order to save his comrades who were left behind, he decides to utilize his Saber's Noble Phantasm, Balmung, clashing with her Clarent. He does not care about winning or losing, only that it is a necessary action. He who does not have a life in the first place thus cannot be said to be risking his life. Red Saber comes out victorious, but only due to the special properties of the weapons and the distance from which they attacked. It is possible utilizing Balmung even a few steps closer may have changed the outcome. She is infuriated because he still lives, and moves to finish him. The event takes place after the Great Holy Grail War, but before Sieg and Jeanne reunite. Sieg, still in the form of Fafnir, is having difficulties keeping control of the Greater Grail, summoning a spiritual body replica of Ritsuka Fujimaru's consciousness from the Shadow Border to aid in the task. As Fafnir he created a terminal of Sieg to properly interact with Ritsuka. Servant Sieg is more of a terminal than an imitation. Just like the Avenger - Jeanne Alter, he will probably disappear once the anthropic principle starts to move properly and his role come to an end. Manaka Sajyou in her dimensional travel saw a solitary and kind dragon (孤高なりし優しき竜, kokō narishi yasashiki ryū? ), waiting for another for a very long time in the Reverse Side of the World. Manaka finds the dragon's appearance to be beautiful, but the dragon does not respond to Manaka, as both of them saw the end of the world. He possesses first-class Magic Circuits. Sieg is a being whose purpose was to have Magic Circuits as the foundation of his body, so his ability to comprehend information is great. He is able to go from being less aware than a baby to gaining knowledge at an abnormal speed in a span of days. He is made to take in mana from the atmosphere and provide it to Servants, and he is able to manually cut the link upon gaining intelligence. Instinctively knowing magecraft, he is able to use the spell "Logic pathStraße/opengehen (理導／開通シュトラセ／ゲーエン, Ridō/kaitsūShutorase/gēen?)" to wish for a result of "destruction" on the glass holding him, causing his magical energy to transform it in a way for the least "destruction" required. Able to understand the mineral the glass is constructed from, it becomes as brittle as a weak piece of wood. When Sieg tries to protect himself from Gordes, he uses this technique to defend himself. His palm became the barrel of a gun - the sheath of a sword - and what it fired was a bullet or perhaps blade that would not only destroy Gordes' arm, but mercilessly devour his heart. it is also said that Sieg can use basic magecraft, such as suggestion and healing magic. Unlike regular homunculi built to be functional, perfect lifeforms, he possesses many physical defects, and while his circuits are first-class, his body is not able to utilize them without failing. Meant only to supply magical energy and not act as a fighter, he is physically weak and will only live three years at most. After gaining Saber of Black's heart, his appearance physically changes and he gains a stronger constitution which leads Rider of Black to claim he can live for more than 100 years. He has special black Command Seals which appeared on the back of Sieg's left hand known as Dead Count Shapeshifter: Dragon Revelation Command Spells (竜告令呪デッドカウント・シェイプシフター, Ryū Tsuge-reijuDeddo Kaunto Sheipushifutā?) which allows him to take the form of the Heroic Spirit Siegfried for 180 seconds (3 minutes). He can only take form using the Command Spell for a limit of three uses. However they can be used as normal Command Seals, but does not use them that way towards Rider. His parameters, experience, technique, personal skills, Noble Phantasms all are replicated perfectly but he cannot match a true Heroic Spirit. His usage of Balmung does not appear impeded by this. He requires adequate magical energy stored in his body and the use of a Command Spell to take on Saber's form. Using Balmung is enough to deplete his reserves completely, causing him to lose Saber's form even as his magic circuits desperately cling to "remain as Saber." His armor and Noble Phantasm disappear, causing Saber of Black to vanish from the world. The process brings extreme pain to his flesh, bones, and nerves, and he loses any ability to move or retaliate. It is possible to transform again, but his body cannot endure to do so consecutively. However, after getting revived by Frankenstein's lightning imbued by her will a piece of her is reborn inside him it ceased to hinder him. Later granting him the perpetual motion machine ability of Bridal Chest, he used it, during his battle with Karna and later Shirou, Sieg managed to use Balmung so many times consecutively only because he continued to instantaneously pull out the sword’s power while replenishing his mana with “Galvanism”. While the Servant version of Siegfried cannot instantly replenish the mana he expends, his sword’s accumulation of prana is overwhelmingly faster than that of an average Anti-Army Noble Phantasm, but still not as fast as Sieg. In terms of speed of his Noble Phantasm use, Sieg was closer to that of the real form of Siegfried than even the heroic spirit copy. The living Siegfried, on the other hand, had his inborn disposition combined with the transformation of his heart into a Magic Core due to being bathed in and drinking a dragon's blood, so he could draw forth magical energy and fire the slash wave even faster than Sieg. Unfortunately, the moment he was summoned as the Servant Saber, that special characteristic of his was highly degraded. When Sieg battles Lancer of Red, he is able to use Balmung together with Galvanism to great effect and is able to activate Balmung consecutively. After witnessing two back-to-back attacks on the level of Brahmastra Kundala, Lancer decides that there is only one way to win and uses Vasavi Shakti. Balmung would have been penetrated in only two seconds, but Sieg used the power of his last command spell to dramatically boost it's strength, allowing it to reach an equal footing with Vasavi Shakti albiet very briefly. It becomes a battle of will from this point on, but since Sieg's opponent was Karna who was famous for his indomitable will, Vasavi Shakti was able to once again begin breaking through Balmung with ease. Before the killing blow, however, he was saved by Astolfo with Achilles' shield Akhilleus Kosmos. Later, during his fight with Shirou and with no command spells left, an enraged Sieg used Galvanism in tandem with the sword skills he learned during his transformations as Siegfried to fight on somewhat even terms with the heavily injured and one-armed Shirou. He was forced to use a weakened version of Blasted Tree against Shirou in their final fight as his trump card after his sword was broken and he was impaled through the chest. Also displaying the ability to transform into the dragon Fafnir due to him having Siegfried's heart giving him dragon blood as he used this to carry the Greater Grail to the Reverse side of the world where phantasmal beasts go where no human can venture so the wish for humanity does not occur as phantasmal beasts are invalid targets. As a result of the transformation he lost his physical form and his final state is that of his soul. Higashide wrote all Sisigou, Reika & Black camp’s character development, while Sieg, Kotomine Shirou & four new servants’s character development was already written by Nasu. The idea for Sieg came from Kinoko Nasu and Takashi Takeuchi. Nasu wanted to introduce a male homunculus to Fate. 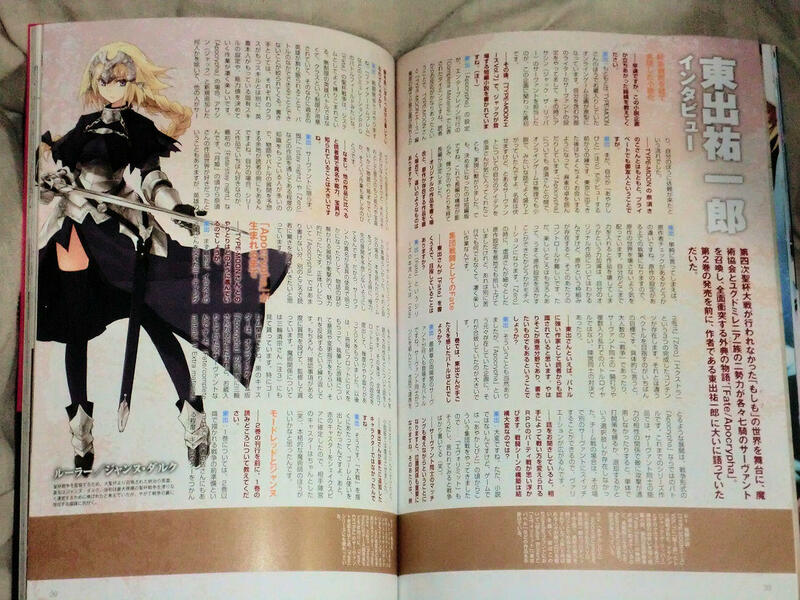 In an interview, Takeuchi stated Homunculus and Jeanne are his favorite characters, along with Altria. Yuuichirou Higashide said that everything started from Sieg. When he was discussing wild ideas with Nasu, Higashide said "his Chest will glitter brightly, three full times! ", to which he found it too stupid so he removed it when he was writing the story. An artificial life-form created using techniques of the Einzberns in order to supply magical energy separately from the Yggdmillennia Masters. He possesses first-class Magic Circuits, but he's a failed creation from birth. The protagonist of the light novel “Fate/Apocrypha”. He was originally a homunculus made by Gordes to supply prana, created not to think anything and fated to die after having his prana wrung out by the Servants, but… Almost all details about him were depicted in the novels through the entire course of his life. After all, he has virtually no past to speak of. Not only that, his life was set to be limited from the beginning as the premise of his birth. Even if he had thought of living a respectable life, he would only have live three years at the most. It’s precisely because of this that he continued to choose absurd, unreasonable and reckless choices for the sake of “what he thought he should do”. Even after he acquired greater longevity, that aspect of him didn’t change. The reason Sieg acted for the sake of humanity at the end naturally wasn’t for humanity’s sake in and of itself. In the first place, Sieg hadn’t experienced enough to completely believe in humanity. However, Jeanne d’Arc waged her life to win the future. It is because he saw that and wished to “become her strength” that he acted, a greatly personal desire. Additionally, his Magic Circuits alone were of such high quality that Avicebron had an eye on him and were in no way inferior to those of Darnic, Yggdmillennia’s head. However, he can only use them to destroy things through Structural Analysis. Even if he had survived, he wouldn’t have had any intention of studying magecraft since he doesn’t have a very positive image of it. Having transformed into one of the Dragon Kind at the end, Sieg has already lost his physical body. His final state is the form of Sieg’s soul after he transformed by making a wish upon the Holy Grail. Incidentally, the words Jeanne spoke at the end of the novel made Sieg finally understand the reason why he continued waiting for her all that time. The two of them take being thick-headed to a new extreme! Dead Count Shapeshifter. The unique Command Spells engraved on Sieg. They can also be used as normal Command Spells, but there was absolutely no need for Sieg to force Astolfo to do anything with a Command Spell, so he used them all to turn himself into Siegfried. To explain it simply, they basically let Sieg summon Siegfried every time he uses one. The catalyst is Siegfried’s living heart. However, while Siegfried’s body could withstand the dragon blood within it, Sieg’s body can’t. That is reason that the spots on Sieg’s hand where the Command Spells disappeared from turned black. Even after he used them all up, power Sieg obtained from Frankenstein’s “Blasted Tree: Lightning Branch of Crucifixion” managed to barely maintain his human form, but that too was used up when Sieg used this Noble Phantasm at the end. One of the Servants of the Black camp. His true name is Siegfried. He is an undisputed great hero and “dragon slayer” who appears in the “Nibelungenlied”. His tall stature, slender body and tanned-colored skin are proof of him having been soaked in the blood of a dragon. The reason the weak point on his back is exposed is because of a “curse” that forces him to do so. It conceptually prevents him from protecting his back. Even if Siegfried were to be protected by something like a spherical barrier, a hole in it would definitely open facing his back. However, there aren’t many heroes who possess the skill to pull off the tricky feat of aiming for Siegfried’s back while fighting him in the first place. Just as the impression of his face gives off, he is reticent, but his bearing, which overflows with dignity, makes him seem well-bred. He is the type to talk with a simple, unsophisticated tone and hold back his words to the absolute minimum needed. That is the foundation of his personality, and it deepened the antagonism between him and his Master Gordes. Siegfried’s legend came into existence around the 5~6th century and spread to many lands. At nearly the same time as the “Nibelungenlied”, the story of the hero Sigurd, the “Volsunga Saga”, came into existence. Wagner’s opera “Der Ring des Nibelungen” is a masterpiece work that compiles these legends together. In the light novels, Siegfried as he was portrayed in the “Nibelungenlied” forms the basic essentials of his character, and he only knows about the Norse Valkyries from second-hand knowledge. With him possessing the noble lineage of royalty, being known for various his adventures and heroic tales and having met a tragic end, there are few heroes who are as heroic as him. But it is precisely because he is such a heroic hero that he was unconsciously burdened by binds. A hero acts out of the supplications of the people, and therefore should not act without being asked. This is because a hero is such a being. Because they possess overwhelmingly immense power, they must not act out of their own will and try to grant their own wish. A hero is a being that fulfills the wishes of others, and must not ever tread any further than that. When his wife and the wife of his brother-in-law wounded each other’s honor and a collision between them became inevitable, he once more granted everyone’s wish. He thought that it would be resolved if he, the cause of it all, died. In the end, it called forth even more tragedy, so it seems the curse of the Rhine gold took effect perfectly. As a Servant, he is basically hard, solid and tough. “Armor of Fafnir: Blood Armor of the Evil Dragon” blocks all regular attacks up to B rank and all Noble Phantasm attacks up to B+ rank and, in addition, “Balmung: Phantasmal Greatsword, Felling of the Sky Demon” unleashes a wide-range attack that displays its true worth against an army. The blue jewel encased in the hilt of the sword contains prana from the Age of Gods, and it is possible to pull out the sword’s power to the maximum with just small quantity of it. During his battle with Karna, Sieg managed to use the Noble Phantasm so many times consecutively only because he continued instantaneously pulling out the sword’s power while replenishing his prana with “Galvanism”. The Servant version of Siegfried cannot instantly replenish the prana he expends, so his sword’s accumulation of prana is overwhelmingly faster than that of an average Anti-Army Noble Phantasm, though still not as fast as Sieg. In the initial plans of the Yggdmillennia team, Siegfried would go out to the front lines and receive the attacks of enemy Servants as Vlad III’s protector. Vlad would be positioned to control the battlefield with “Kaziklu Bey: Lord of Execution”. Jack the Ripper would kill the enemy Masters and cause chaos in the enemy’s rear guard along with Frankenstein. Astolfo would guide the golems and control the situation with Avicebron, while Chiron would act as support by shooting at areas where a hole in the enemy lines could be made. It was truly a perfect formation as an academic theory, but they were forced to tearfully change tactics due to Siegfried unbelievably leaving the battlefield before the war actually began. Higashide: This the instant-Servant and homunculus, Sieg-kun. When I think about it, everything started from him. This is bit of a digression, but when we were talking about wild ideas with Nasu-san, I said, “His chest will glitter brightly, three full times!”, but when I was seriously writing the story, I found it too stupid so I removed it. Konoe: Sieg-kun in his transformed hero form will be in the highlight scene of the final fifth volume as well! Please look forward to it! And each time Siegfried’s armor appears in an illustration, I receive no mercy as my arm dies due to the miraculous number of lines I have to draw. Good heavens!